Labour has had to "make-up ground" in tackling anti-Semitism, according to Wales' first minister Mark Drakeford. The party has been hit by an on-going row about how it has handled incidents within its membership. The Welsh Labour leader said in a press conference that the on-going story has damaged the party's reputation. "No party is immune from prejudice," he said, adding there was "absolutely no place at all in the Labour party" or more widely for anti-Semitism. Senior figures have clashed over how complaints should be handled. At the weekend shadow chancellor John McDonnell backed Labour's general secretary Jennie Formby, who accused deputy leader Tom Watson of "unacceptable" behaviour by asking MPs to forward anti-Semitism complaints to him as well as the party. 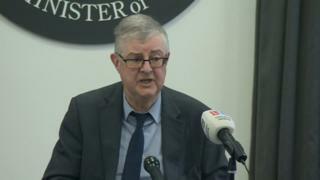 Mr Drakeford said: "There is absolutely no place at all in the Labour party or more widely in Welsh politics for anti-Semitism. "And where examples of it are discovered then they must be dealt with rapidly and thoroughly by the Labour party. "I don't think it's unfair to say that the Labour Party has had to make-up ground in getting to a position where we can say confidently that that is the way that those incidents are being responded to, and along the way, this whole story has done reputational damage to the Labour party." Asked if he had seen an increase, he said: "What I think I've seen is the fact that when an issue becomes more prominent, then things that might have been there all along get seen in a way previously attention might not have been drawn to them. "My experience is not that there is more of something but that the attention being paid to that topic means that we are more aware of what was there in the first place." "No party is immune from prejudice, and Labour is a mass membership party with lots of people having joined the party in the recent past," he added. "This issue, in that way helpfully, has led us to take account of incidents in other times, when this issue wasn't so prominent... may not have been noticed in the way that it has been."